Square Stand: I thought Jack Dorsey’s company would kill off the credit card. Will Square save it instead? 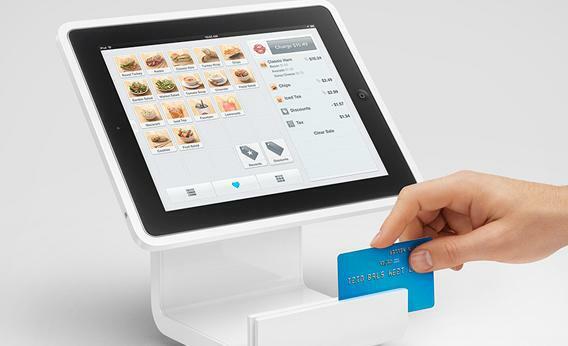 This morning Square announced a new product that took me by surprise: the Square Stand, an iPad holder and credit card reader that’s meant to function as a point-of-sale system for high-volume small businesses like restaurants and cafes. The Square Stand costs $299, which is far more expensive than zero, which is what Square charges for the tiny credit card reader that made it famous. What do small businesses get for their $299? First, the Square Stand is pretty. In glossy, rounded white plastic, the device is the most Apple-like thing not made by Apple I’ve ever seen, right down to its packaging. Compared with the ugly cash register you’ll find at your favorite lunch spot, it’s stunning. More than that, the Square Stand is fast. Square’s free credit card reader sometimes requires patient, slow swiping, which isn’t ideal for businesses that attract long lines of customers at peak times. Jack Dorsey, Square’s founder, says the Square Stand incorporates two credit card sensors and has a long swiping strip, allowing cashiers to swipe your card in any direction, very quickly. The Stand also makes for quick integration with other payment hardware commonly found in small stores—just plug your cash drawer, barcode scanner, or receipt printer into the system’s USB hub and you’re done. This sounds like a small thing, but it’s not. My sister owns a bakery in Southern California. A couple of years ago, when I set up her cash drawer and receipt printer with a rival iPad payments system, it took me an hour or so of impatient technical fiddling to get the whole thing to work. That won’t be necessary with the Square Stand. Though this new product seems cool and useful, the fact that Square put so much into improving the credit card-swiping experience caught me off guard. Square has always seemed like a software company masquerading as a hardware firm. The credit card reader was just a bridge to the future—a future in which customers and businesses would connect to one another wirelessly, making payments invisible, frictionless, and elegant. As Dorsey explained to me last year, most other companies that are working to digitize payments are just trying to improve what he calls “payment mechanics”—that is, they’re trying to find a way to replace cash and credit cards with your phone. But Dorsey rightly sees no great benefit to paying with your phone instead of your card; you’ve still got to pull something out of your pocket and wave it in front of a payment device. In Dorsey’s perfect future, we’d all dispense with phones and cards and cash, and instead we’d pay by doing nothing: The cashier would recognize you, add your purchase to your tab, and you’d be on your way, the payment never becoming an awkward barrier between buyer and seller. That sounds like science fiction. But, amazingly, Square has already built this perfect payment system, and it’s operational today. This feature, which has gone through many branding revisions—it began its life as Card Case, then became Pay With Square, and now it’s called Square Wallet—allows people who install Square’s app on their phones to pay for stuff at some merchants without sticking their hands in their pockets. All you do is tell the guy at the register your name: The Square app on your phone automatically connects with the merchant’s Square account, your picture appears on the teller’s screen, and once he presses your face, your money flies out of your account into his. This invisible payment system has received glowing reviews from techies. David Pogue called it “glorious.” I called it “magical.” The headline of my story, by the way: “The End of the Credit Card?” I didn’t think the question mark was necessary. Translation: Credit cards will be here for a good long time. This isn’t a novel admission; Dorsey has always said that he doesn’t think plastic will go away anytime soon. But the launch of the Square Stand—a device engineered to improve the credit card experience—shows how deeply Square is betting on credit cards. It’s as if, after building the Model T, Henry Ford also spent a lot of money to build a faster horse, just to hedge his bets. In this way, Square Stand prompts a deeper question: What if, as wonderful as Square Wallet is, we just never move beyond credit cards? What if people find faster horses good enough? After all, credit cards are pretty good. They’re more convenient than cash and checks, they’re smaller and cheaper than your phone, they rely on infrastructure that’s ubiquitous, and they’re pretty secure. Sure, they sometimes fail—the guy at the pizza shop filches the number you read to him over the phone—but they’re so well-insured by the credit card industry that you have no qualms giving out your number to the next pizza shop you call. The only long-standing problem with credit cards is that they require real-time bank approval to use, and—especially for small businesses—they’re more costly to process than cash. But Square solved those problems. Its reader let businesses accept credit cards anywhere they had a data connection, and its low, transparent prices made it affordable to do so. After that, what was there to not love about credit cards? Well, Dorsey, like all perfectionists, can think of several things. You’ve still got to take something out of your pocket and hand it over. You’ve still got to sign—an awkward, inelegant gesture that adds unnecessary friction to some transactions. (It doesn’t make much sense that, in a restaurant, you have to wait for the waiter to pick up your card and ring it up, just so he can bring it back to you for your tip and signature.) Worst of all, the whole process is impersonal. As he told me last year, the act of opening up your wallet, finding your card, handing it over, and signing creates a kind of psychic overhead—it makes you “feel bad.” If we made money invisible, we’d all feel better when we shopped. I agree with him. Paying with Square—paying with nothing—is better than paying with something. But I also suspect that for a lot of people, that psychic baggage isn’t such a big deal. Credit cards just work. They’re fast, they’re easy to understand, and they’re everywhere. Sure, we could make payments work better, but why should we when everyone really seems to like plastic? In this case, a faster horse might just be good enough.